“I assure you madame, I am an honest man.” He attempted to straighten his clothes: they had been fine once perhaps, but they were torn and dirty now. A wilted feather protruded uncertainly from his ragged hat. The scabbard at his waist was empty. The old woman’s sticks tapped on the ground in her shaking hands, she was bent double, a tiny thing – frail and hunched like a bag of broken sticks. “This place is full of your ‘honest men’ madame.” The man looked around, bones littered the catacombs, discarded and strewn haphazardly where the rats – or worse – had gnawed at them. The laughter grew louder, the crone’s little body shuddered with alarming convulsions. “Let’s end this charade he says!” The man watched in alarm as the crone shrugged off her shawl and robe and stood, appallingly naked. She let her walking sticks drop to the floor and her hands seemed suddenly firm and measured as she gripped the folds of her dry, wrinkled skin and with care and practiced ease, began to peel it away. The tiny twisted black thing stood before him, it was still cackling but the sound was fiercer now, like logs cracking and spitting as the fire took them. The man watched in horror as sparks leapt across the creature’s flesh and smoke began to rise from it, obscuring it as it folded the rolls of loose, discarded skin and placed them with care to one side. “A moment! A moment! I am not as young as I once was!” The crone’s voice came from the creature, but its jaw did not move, and as it turned to regard the man he could see that it’s mouth and eyes were filled with flame; flame that spread across its body, engulfing the tiny figure in an inferno. A blackened, skeletal arm reached from the fireball and picked up the knife. The Soucouyant: a lesser breed of vampire, but one that is skilled in dark magic and witchcraft. By day it disguises itself as an old crone, but at night it will peel away its skin to reveal its true form, which, though small, possesses all the strength of its vampire kin. Using dark magic it wreathes itself in fire and flies through the night, looking for victims. It feeds on the blood of those that it finds, or shares the blood with other vampires. Drawn to the Throne of Bones, the Soucouyant is shunned by the ghouls – who can spot a trickster a league away and find them repellent, for though they like a good joke, they have no mind for deceit. Soucouyants are never alone for long, usually they attach themselves to a more powerful vampire and bring it food or information. In exchange the Soucouyant hopes to be taught more spells and powers – its thirst for knowledge is almost as great as its thirst for blood. Though physically frail compared to the monstrous Strigoi and simple-minded compared to the Necrarch, the Soucouyant’s main weakness is its dependence on others. It lacks the confidence or ability to survive alone for long. In addition, it has strange compulsions that often confuse or distract it, such as the compulsion to gather dropped or discarded items. This has lead to the belief that to escape a Soucouyant one should throw coins or grains of rice at its feet and flee while it pauses to pick them up. Whether this is true or not, the Soucouyant is a horder, and its lair is full of stolen items and bottles of moldering blood. This model (in vampire witch form and fireball form) will eventually be part of another Mordheim Undead warband, but for now she will serve as an NPC in the Throne of Bones. 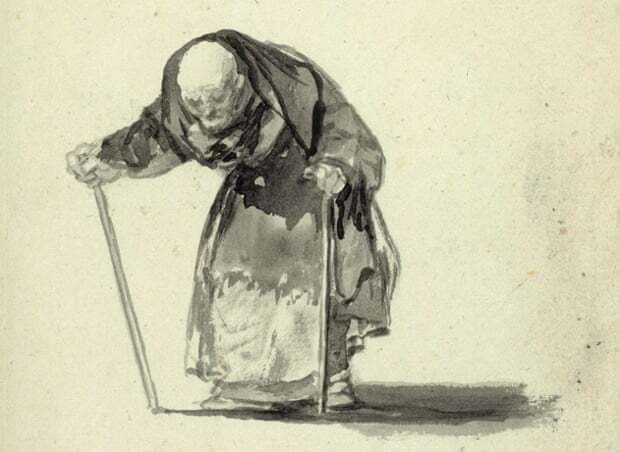 The inspiration for the model was Goya’s old women and witches sketches, particularly this one. I think Goya understood that old women are not to be trusted, although he never explicitly stated that this was because he thought they were all vampires. The photos are in the style of a vanitas. Vanitas images were intended to remind people of the inevitability of death and the fruitlessness of humanities efforts in life. The word vanitas translates as vanity, the original meaning of which was futility, hence ‘Omnia Vanitas‘ – all is futile. Wow, what an individual, a true character. I also like the background, nice twist on the usual vampire tropes. Cheers Neil, although that’s not my desk, I staged this little photoshoot. I think the vanitas, the illustration, the story and the miniature are all about the same level of importance (or unimportance). A couple more weird vampires coming soon, and I just learned about a Japanese type that can stretch its neck which is pretty cool. The fate of that poor ‘honest’ man reminds me of the Monty Python Hells grannies skit. Further evidence that old women are not to be trusted one jot…. How did you make the flame ball, it looks brilliant. I thought I had written how I did that – it’s a spirit host torso with flames sculpted from a filler that dries clear, then painted with translucent and fluorescent paints. You can see the black body through the fire, which is what I wanted, but it’s not a perfect technique – the filler doesn’t dry with sharp edges and even with a matt varnish it is still a bit glossy and doesn’t photograph well. I think I will try this technique again though in the future.